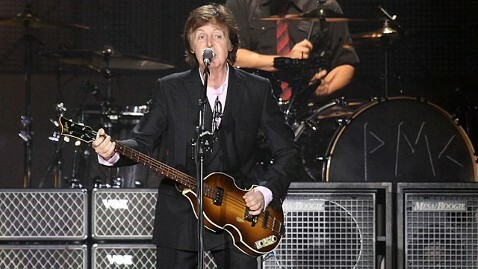 Things are definitely getting better all the time for former Beatle Sir Paul McCartney. Nearly 20 years after first being nominated to claim his star on the Hollywood Walk of Fame in 1993, McCartney will get his star in a ceremony outside the Capitol Records building today. McCartney is the last of the Beatles to receive this honor, despite probably being the most successful in his solo career. The 69 year-old- rock star attended the ceremonies honoring his band mates Ringo Starr in 2010, and George Harrison in 2009 as their stars were unveiled in Hollywood. Even the band itself has its own star, permanently marking their legendary music and their long-lasting impact on music culture all over the world. "McCartney's star will be lined up on the famed walk alongside his fellow Beatles, Ringo Starr, George Harrison and John Lennon in front of the famed historic Capitol Records building located at 1750 N. Vine Street," according to a post on the Walk of Fame's website. McCartney was first nominated in 1993, but due to scheduling issues the ceremony never took place until now. According to the Walk of Fame's website, Hollywood Chamber of Commerce CEO Leron Gubler will present McCartney's star. Today also marks the anniversary of the Beatles historic first appearance on the "Ed Sullivan Show" on February 9, 1964, changing the music world forever. McCartney released his new album Kisses on the Bottom a compilation of tributes to McCartney's favorites, plus two new original songs on February 7. According the Grammy website, McCartney is also set to perform at Music's Biggest Night this Sunday.